Happy Labor Day! I am enjoying my day off as I hope you are too. Dallas has been hit with the most wonderful fall weather. It just feels so great to be able to breath outside again and to be able to wear clothes and not start pouring down in perspiration. Last week, I celebrated the fall like weather with bringing out a highlighted trend of this season...a little houndstooth. This is print that never really goes out of style, but it can be seen highlighted in a variety of collections this fall. This, I think is a dress (which I have worn it as), but can also double for a nice fall jacket. I paired this with a high waist skirt from David's Bridal. You have seen me wear this a million times...lol. A shirt that I bought last season from Target, and the necklace came from H&M. The shoes are a patent and suede leather combo from Nordstrom. 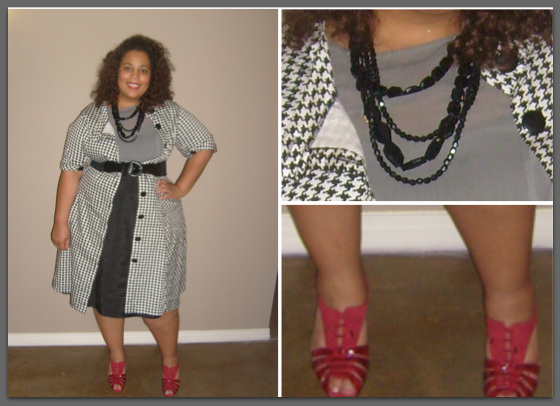 The dress/jacket came from Stylish Consignments in Atlanta. The piece originally came from Shabby Apple. Their prices range from $89 - $160. I am a little ho hum on them though. I actually won a piece from them on a blog. Although the jacket it cute, the button holes are unraveling and the button are cheap (one of them broke). I was thinking maybe because I bought this second hand, but no. The clothes just feel a little cheap in general. The piece that I won was cute. I really do like their design aesthetic. I just had similar issues with the dress that I won. Button holes unraveling, cheap buttons, and the fabric...well lets just say if you throw it in the washing machine its over for that garment. Over all, for Shabby Apple, cute clothes, but cheaply made. I haven't actually bought a piece, but if I were I would be okay paying $89 for a piece, but I definitely would not pay $160. They seem to clearance some pieces for around $50 and honestly thats what I feel the clothes are worth...around $50. 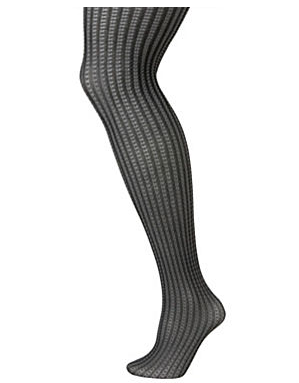 I am really loving the attention that houndstooth is getting this season and I hope to add a few more pieces. Here are some of my other picks of fun ways to incorporate this print into your wardrobe. 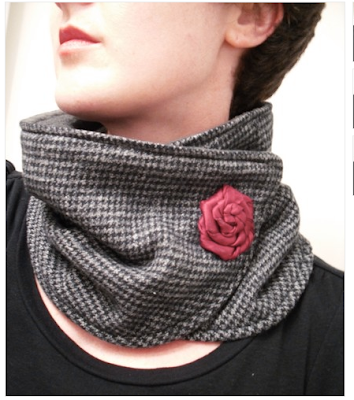 I am such a big fan of houndstooth, too! I have a fave coat that I got 7 years ago and it's still in style! Great fashion highlight! cute look!!! 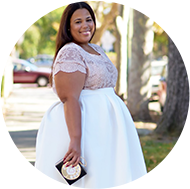 I think i may incorporate the look with the tights you showed from lane bryant! That houndstooth jacket is a great addition to your fall wardrobe. You have so many options to pair it with!